PACK: Osprey Exos 58L (1.08kg) – a lightweight pack with a decent frame that keeps the weight off your lower back, unlike my previous Osprey Kyte 66. That pack didn’t distribute the weight well, though was hardy as and coped equally with being dragged through the Tararua forest as with being thrown into the hold of a plane. I am not sure the Exos can cope as well with either but we will see. Post trail: absolutely loved this pack on the TA. Really well designed, really comfortable, really roomy. Make sure to check sizes carefully – I might have suited a Small size better than the Medium which I took, though note that the Small size is quietly 4L smaller capacity. SLEEPING GEAR: I’ll be resting my weary muscles inside a Tundra Pure -5 Sleeping Bag (860g including bag). Tundra – a UK company – make excellent sleeping bags from ethically sourced down. In the future, I hope synthetic products would be as practical (i.e. light and small) and comfortable (i.e. warm) as down. But until we are there, down products remain far superior. That raises an ethical quandary, because there is a spectrum of ways to produce and collect down, ranging from good to unacceptable. I really like Tundra’s ethos and approach. In addition, the quality is really high. All the bags are made to order, and for the height-challenged amongst us they will make a shorter, warmer bag (using the same amount of down) at the same cost. I am looking forward to trying it properly on the trail. I’ll drift into slumber on top of a Thermarest Prolite Women’s sleeping mat (460g). This was actually a weight gain as I discovered that my cheapo 3/4 length thermarest rip-off was super cold compared to other people’s gear, but I wanted something hardier than the really lightweight options. For the colder nights as I get further down the South Island I will use a Jag Bag, a NZ-made silk sleeping bag liner now owned by a UK company, TerraVistaTrails (125g). This is my first silk sleeping bag liner after upgrading from a cheapo and heavy cotton one so I’m pretty stoked about this. The mummy-shaped liner has a pillow section which I’ll fill with clothes. Post trail: I still adore my Tundra bag and Jag Bag liner and enjoyed every single night’s sleep in them. I could easily have gone for a 0 degrees bag rather than -5 to save more grams but I am paranoid about cold. The Tundra bag remains soft, warm and downy after 100+ nights of use. No other comments other than to say you will not regret getting a Tundra bag. TENT: Terra Nova Laser Competition 1 (1kg). As soon as I work out how to pitch and ventilate this properly, this is going to be a great tent. Not so sure about the pegs which are as thin as hair grips but I’m keen to give them the benefit of the doubt. I’ve eschewed the extra expense of the ‘footprint’ – used to extend the life of the tent by reducing wear on the groundsheet – in favour of a cheap piece of tarp. Post trail. A great tent. Requires a bit of practise to get the pitching right, and check it before you go to bed as changing heat and humidity changes the tent’s shape. I instantly lost the tiny pegs and upgraded to MSR Mini Groundhogs which are brilliantly light and tough. Unfortunately Kea-gate at Cascade Saddle means it doesn’t look as pristine as it once did. COOKING: for most of the trail I’ll be on my own so I’m carrying all my own cooking gear. When everyone else isn’t around to judge me I’m just going to eat rice and peanut butter so all I’ll need is a tiny billy and a basic gas stove. Plus my wonderful new lightweight spoon, a super thin chopping board for those rare days where there are vegetables involved, Swiss Army knife, bowl and mug etc. Post trail: Gas worked great for me on the trail. Lots of people swear by the low gas-use of the Jetboil but I prefer the flexibility of a stove and pans. I used just short of 30g gas per day per person, for porridge + tea, one cuppa during day plus simmering for 10-15 minutes for dinner. ELECTRONICS: for navigation and camera I’m using an iPhone SE (130g incl case), my biggest upgrade ahead of the trail in term of $, but long overdue after 6.5 years with an iPhone 3GS. iHike GPS is an excellent app, and the integration with the mapping materials provided by Te Araroa Trust is superb. It was very easy to download all the maps I needed and overlay the routes. Because I’m using it for nav I need to be sure I will always have power so I am taking an Anker Powercore 10000 (185g) which seemed like a good balance between weight and capacity. For reading (yeah right) I am taking my kindle (195g). Post trail: The Anker was great. I used iHike GPS before switching to the TA Guthook App because of the ability to calculate the distance and height gain/loss and the info about possible camping spots. The iPhone was brilliant for photos and off-trail communications including blogging. 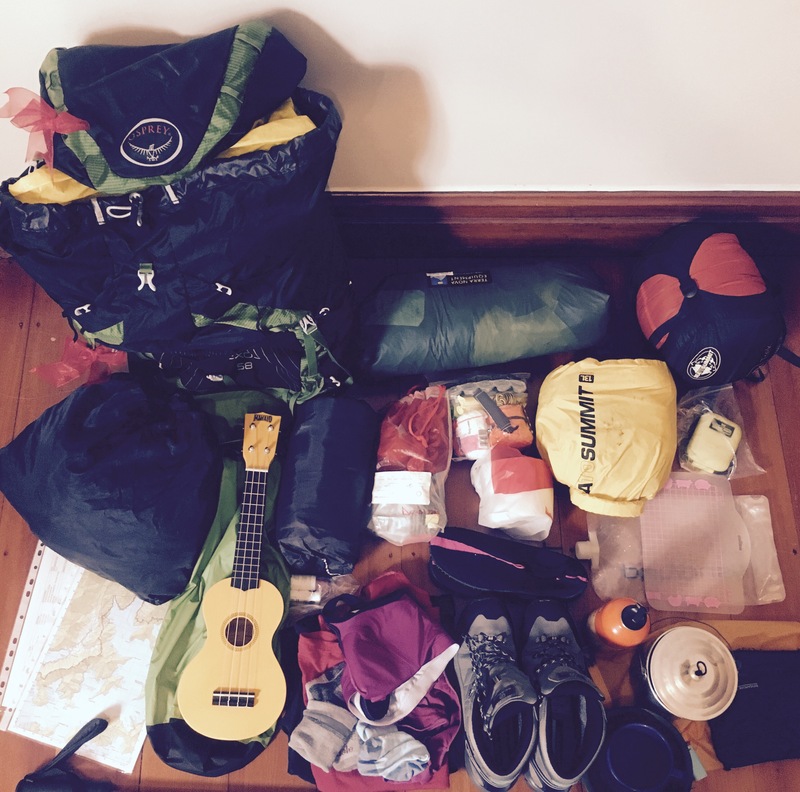 CLOTHING: I’m sticking to the ways I’ve learnt from tramping with Wellington Tramping and Mountaineering Club, which is that you take one set of clothes for tramping, and one for sleeping, and never the twain shall meet. This is so that you always keep a set of dry gear for the evenings and emergencies. I made one upgrade, which was a synthetic ‘down’ jacket for the evenings. The weight is the same as my previous ugly cheap fleece (400g) but it packs down much smaller and will be much warmer (I hope). Post trail: I walked in running shorts which I loved and they survived the whole island. I was always grateful for a warm layer. I ended up gaining a ‘town-top’ – an item of clothing you wear when in town to feel less like hiker trash and/or while clothes are washing. If you can find something light I highly recommend this as a luxury. The one piece of gear I didn’t quite get right was hut shoes. I took kayak shoes which weigh about 400g and are very easy to pack. They were not very warm and once they got damp they stayed damp. Others had ‘barefoot’ style jandals which seemed good. Crocs are brilliantly light but so big in your pack. I have recently bought North Face Basecamp sandals which I love. FOOTWEAR: after MUCH deliberation (sorry family for putting you through this) I have concluded after The Ankle Incident that I am not one of those who can wear shoes on the trail. Moreover, because my ankle is not in good shape, I actually need MORE ankle support than I did before this whole sorry saga commenced. However my Asolo leather boots are overkill for much of the trail so I’ve opted for Scarpa Nangpa La GTX which seemed like a good balance between flexible sole and lighter weight than my leather boots (around 1300g) whilst remaining hardy enough to cope with scrub and scree, with full ankle support. This late change to my gear might prove to be a terrible mistake, and if so I apologise in advance to my tramping companions. I was in such desperation to take a decision on shoes that I gave myself a horrible blister on my finger whilst tying up the laces in the shop… awkward. Post trail: the Scarpas were great, but I forgot to get extra insoles for arch support as I would normally wear in my other boots. This is possibly a contributing factor to my Plantar Fasciitis injury which still plagues me six months on. They had holes in them after the hike and worn heels, so I retired them but bought another pair as I like them for lighter-but-still-quite-strong summer boots. SAFETY: I’m carrying a Personal Locator Beacon which in a life-threatening emergency can be used to alert search and rescue to your location via satellite. I have a first aid and repair kit made of various haphazardly collected items. Two excellent last minute additions were a Formcard (13g) which is a reusable mouldable plastic card which melts in hot water and hardens to fix all manner of things, and the smallest tube of superglue of all time. Post trail: didn’t get to test the formcard yet. HEALTH, HYGIENE, ALL THE REST: nothing particularly interesting to report here other than to say that for those parts of the trail where toilets are not where you need them (e.g. when freedom camping, where allowed) I will be carrying a homemade trowel for digging holes, inspired by the handicraft of many trampers before me consisting of a MSR Tent Stake. This is important to mention because Te Araroa hikers have a reputation for bad behaviour in this regard, which I don’t think is warranted and I suspect people just like saying it to have things to moan about. As for hygiene, I’m not particularly concerned about anything but am grateful to Gustofrenzy for the excellent post on trail hygiene for women. Given a recent warning of a gastro bug amongst trampers on the Travers-Sabine track I will reluctantly carry hand sanitiser. I’ll wear daily disposable contact lenses which I think is probably less risky than washing lenses every day with saline and muddy fingers. Sun lotion, lip balm and sandfly repellent adds a few more grams. Post trail: I am a strong advocate for the pee rag and the trowel stake. I found that buying small packs of tissues (most super-markets in NZ sell a thin flat box of 90 that costs about $1) was more convenient than toilet rolls. I took washing a bit more seriously than I normally do on tramps and was grateful for having brought a super thin Liz Earle linen face cloth to allow for a proper wash when river / huts allowed it. MUSIC: the ukulele (350g) travels on the side of my pack, in a 20L Sea to Summit dry bag. The tuner has been determined out of scope. My lovely friends have made me a kindle songbook with chords and words so I don’t have to carry paper copies of the songs. There’s still time to get more songs so if you have any good trail song suggestions let me know. Hit The Road Jack is already in. Post trail: didn’t regret this one bit.